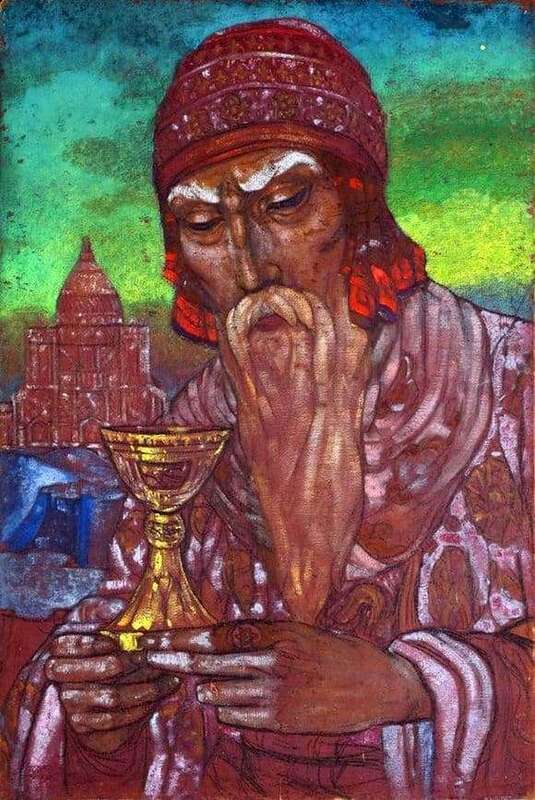 In the early 20s of the 20th century, Svyatoslav Roerich became interested in writing pictures on religious subjects. One of these paintings was the painting “Tsar Solomon”, written in the fall of 1923, inspired by a visit to Italy. This picture was supposed to be part of a certain series of paintings dedicated to the spiritual wealth of all earthly civilizations. It was written, not without interference from Nicholas Roerich – the father of the painter, a famous writer and literary critic. The influence of the father can be traced, first of all, in the image of the man in the picture, the features of King Solomon exactly repeat the features of Nikolai Roerich. In the foreground of the picture, the viewer sees a large bowl, which is held in the hands of a rather elderly man with a long beard falling down. The artist paid special attention to the creation of this beard, drawing the smallest details as if it were not a drawing, but a sculptural composition. Those who are well acquainted with the legend of Solomon know that the cup presented is the cup of life, which the king drank in full, erecting his famous temple on the Hill of Covenant. The man holding the cup is Solomon himself. His eyes are half closed, dozens of wrinkles can be seen under them. The king wears a plain, apparently silk, robe. On the king’s hand is a gold ring with the Star of David. The clothes of the king are magnificently decorated, which allows us to immediately understand that it is not a simple person in front of the audience. This is also evidenced by an expensive headdress. The background of the picture decorates the Temple of Solomon, traced against the background of the last rays of the setting sun. In the form of the picture there is a certain sadness and remoteness, it seems that the legendary king no longer associates anything with this earth, except for the cup, which he stubbornly continues to hold in his hands, despite the fact that it has long since emptied. It is the emptiness of the cup that becomes the reason for sadness, which can be read on the royal tattered royal face. For the given period of time the picture is in a private collection and is not exposed on a general review.